Blog Quick Quotes: Winter Inspiration with June! Hello Quick Quotes fans! Welcome to a new year of inspiration and fun! I am thrilled to be back with you for another year on the Design Team. I love the beautiful pattern papers and pretty snowflake embellishments of the January Club Q. To add a pop of color, I started by blending a wintery mix of PowderPuff inks (Evergreen, Lipstick, Baja Blue, Plum, Aqua, Green Leaf) on white cardstock and die cutting letters from them. I also splattered the letters with white paint. From the ribbon and snowflakes to the pattern papers, most of the items on this card came with the Club Q kit. 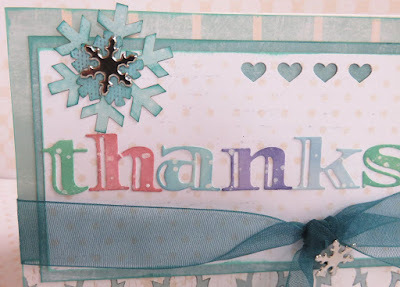 I did add the metal snowflake brads, PowderPuff Chalking inks and die cut letters from my stash. The great thing about this design is that you can easily change the sentiment by die cutting "happy" or "congrats" to make cards for different occasions.